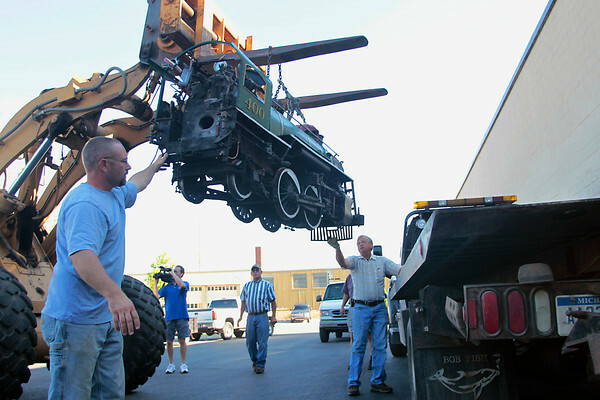 Bill Fenton, left, and Glenn Arnold of the Northwest Michigan Engine and Thresher Club guide the Spirit of Traverse City as it is hoisted onto a truck to be transported to the site of the Buckley Old Engine Show Friday morning in Traverse City. The 2,770 pound train formerly ran at Clinch Park. Ward Eaton Towing provided the transporting truck for free. "I want to keep it as safe as I can, this is my baby here," said Bancroft.